CMOS: Front-End Electronics for Radiation Sensors offers a comprehensive introduction to integrated front-end electronics for radiation detectors, focusing on devices that capture individual particles or photons and are used in nuclear and high energy physics, space instrumentation, medical physics, homeland security, and related fields. 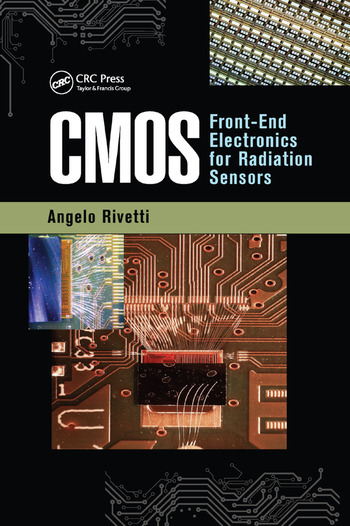 CMOS: Front-End Electronics for Radiation Sensors provides specialized knowledge previously obtained only through the study of multiple technical and scientific papers. It is an ideal text for students of physics and electronics engineering, as well as a useful reference for experienced practitioners. Angelo Rivetti received a degree in physics from the University of Torino, Italy, and a Ph.D in electrical engineering from the Politecnico di Torino, Italy. From 1998 to 2000, he worked at the Conseil Européen pour la Recherche Nucléaire (CERN), Meyrin, Switzerland on the implementation of radiation tolerant integrated circuits in commercial deep submicron complementary metal–oxide–semiconductor (CMOS) technologies. From 2000 to 2001, he was an assistant professor with the faculty of physics at the University of Torino. In December 2001, he joined the Istituto Nazionale di Fisica Nucleare (INFN), Torino, Italy, where he developed very-large-scale integration (VLSI) front-end circuits now in use in the A Large Ion Collider Experiment (ALICE) and Common Muon and Proton Apparatus for Structure and Spectroscopy (COMPASS) experiments at CERN. He is currently a senior member of the research and technology staff at INFN. His research interests are in the design of mixed signal front-end electronics for hybrid and monolithic radiation detectors employed in high energy physics, medical imaging, and industrial applications. "… an essential resource for whoever is involved with radiation sensors from the circuit design perspective. It nicely covers all topics of practical interest, gradually leading from general concepts to specific aspects and bringing several interesting examples. The author was able to effectively transfer his wide knowledge and experience, both as a researcher and as an educator, into this amazing piece of work. The book can lead newcomers to rapidly learn how to address the analysis and design of front-end circuits, but it is also suitable for experts to refresh some important concepts without the need to go through many scientific papers." "… a well-organized, clear, and comprehensive guide to the design of low-noise front-end electronics for sensors. An ideal introduction for beginners and students, and a valuable reference for experienced designers." "Reflecting the author’s extensive experience, the book covers the design and implementation of the front-end electronics optimized for the amplification, conditioning, and digitization of signals in radiation sensors. This body of knowledge, developed along many decades within the high energy and nuclear physics communities, was dispersed in many specialized articles. Now it is collected, summarized, and enriched in an impressive book of about 700 pages, which covers both the theoretical background and many implementation practical aspects. This is the book that many people in the field were waiting for."